Cancer is now so common it affects about one of two of us and most will face it at some point in their lives, either personally or through a friend or relative. Compelling research indicates that the answer to our burgeoning cancer epidemic could be far closer than previously imagined, in the form of a ketogenic diet. Personally, I believe this is an absolutely crucial facet of cancer prevention and treatment, for whatever type of cancer you’re trying to address, and hopefully, some day it will be adopted as a first line of treatment by mainstream medicine. A ketogenic diet calls for eliminating all but non-starchy vegetable carbohydrates, and replacing them with high amounts of healthy fats and low to moderate amounts of high-quality protein. The premise is that since cancer  cells need glucose to thrive, and carbohydrates turn into glucose in your body, then lowering the glucose level in your blood through carb and protein restriction literally starves the cancer cells to death. Additionally, low protein intake tends to minimize the mTOR pathway that accelerates cell proliferation and lowers the amount of one particular amino acid, glutamine, which is also known to drive certain cancers. This type of diet is what I recommend for everyone, whether you have cancer or not, because it will help you convert from carb burning mode to fat burning, which will help you optimize your weight and prevent virtually all chronic degenerative disease. 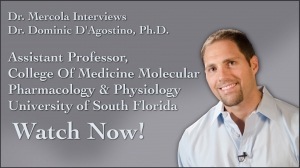 Dr. Dominic D’Agostino, PhD is an assistant professor at the University of South Florida College of Medicine. He teaches courses in molecular pharmacology and physiology, and maintains involvement in several studies researching metabolic treatments for neurological disorders such as seizures, Alzheimer’s, ALS, and cancer—all of which are metabolically linked. His entry in to this field began when, in 2007, the Office of Naval Research funded his study into seizures related to oxygen toxicity experienced by Navy SEAL divers using closed-circuit breathing apparatus. At this juncture, he came across the ketogenic diet, which has already been confirmed as an effective treatment for epilepsy and a variety of seizure disorders. “I came across the work of Thomas Seyfried ,” he says. “I found a large amount of evidence that suggested that cancer was metabolically unique. Genetically, it was very heterogeneous. There are a host of different genetic anomalies in the cancer cells, but one characteristic is that it had this ubiquitous metabolic phenotype, which was aerobic glycolysis. Even in the presence of oxygen, it was shown that cancer cells continue to pump out lactate, suggesting that they’re fuelling their metabolism from excess glucose consumption. A mounting body of evidence suggests cancer is responsive to therapeutic ketosis—a natural physiologic state induced during prolonged states of decreased glucose. Nutritional ketosis involves restricting carbohydrates in order to decrease the availability of glucose. Restricting carbs also increases production of ketone bodies from your liver. Nearly all of your normal cells have the flexibility to readily adapt to using ketone bodies for fuel in lieu of glucose, but cancer cells do not have this metabolic flexibility. Hence, they effectively starve to death while all your normal cells actually operate more efficiently than before. When you restrict carbohydrates, you prevent spikes in blood sugar, insulin and IGF-1 from occurring. These spikes are actually very pro-inflammatory, and can activate oncogenes (genes that contribute to the conversion of a normal cell into a cancerous cell), and enhance both cancer cell proliferation and the metastatic process. But here’s a key point: While carb restriction will reduce these spikes, it will not have a major impact on baseline levels of blood glucose, unless you also restrict your calorie and protein intake. So for cancer prevention and treatment, carb restriction must be combined with calorie restriction and moderate protein restriction in order to effectively “starve” cancer cells of their preferred fuel (glucose and glutamine). “The ketogenic diet is, I think, a very good strategy to make calorie restriction tolerable,” Dr. D’Agostino says. “Because when your brain in particular is craving glucose, and, say, for example, you go on a calorie-restricted diet, but it’s a high-carbohydrate diet, you’re still getting fluctuations in blood glucose. Your brain goes through these intermittent periods of glucose deprivation and you get very hungry. It’s not a very comfortable feeling. Nutritional ketosis, which occurs with carbohydrate restriction and is further enhanced with calorie restriction, forces the physiological shift from a glucose-based metabolism to a fatty acid and ketone metabolism. When your body is, shall we say, keto-adapted, your brain energy metabolism is more stable and your mood is more stable. It may take a few weeks to adapt physiologically to this. But nutritional ketosis can be maintained and sustained with carbohydrate restriction and is further enhanced with calorie restriction. How Much Protein Is Advisable? So to summarize, in order to maintain and sustain nutritional ketosis, you need to decrease both carbohydrates and protein. But how much protein is enough, or too much? As Dr. D’Agostino mentions above, eating two to three grams of protein per kilogram of bodyweight—which translates to 100-300 grams of protein per day for some people—is an enormous overload. Many bodybuilders will consume this much though, and many non-athletes as well. The bodybuilding industry has fostered the idea that you need tons of protein to build muscle, but as Dr. D’Agostino explains, if you restrict protein, and replace both the lost protein and carbs with healthful fats, the elevation in your blood ketones will have a protein-sparing, or anti-catabolic, effect. “It will help you preserve lean body mass and a physical performance during a calorie deficit. This is why the ketogenic diet is an effective strategy for losing weight and retaining muscle, especially if it’s complemented with resistance exercise or some kind of physical activity,” he says. Your end goal needs to be taken into consideration here though. A bodybuilder’s purpose for embarking on a ketogenic diet will be different from someone with cancer or a seizure disorder. In the latter case, you’d need to be far more strict with reducing protein in order to achieve and maintain ketosis. Personally, I’m intrigued with the concept promoted by one of my mentors, Dr. Ron Rosedale, who advocates restricting protein to one gram per kilogram of lean body mass. Typically, for someone like myself, that amounts to about 50-70 grams of protein per day. The reason he promotes this so much is because of the stimulatory effect protein (branch-chained amino acids specifically) has on mammalian target of rapamycin (mTOR)—a pathway that seems to be largely responsible for the pathology seen in cancer growth. When you reduce protein to just what your body needs, mTOR remains inhibited, which helps lessen your chances of cancer growth. “I agree that mTOR is an important signal once you have cancer,” Dr. D’Agostino says. “The amino acid leucine is a powerful activator of the mTOR pathway, and stimulates skeletal muscle protein synthesis. Now, if a normal healthy person consumes boluses of leucine [a branch-chained amino acid], say five grams a couple of times a day, which a lot of bodybuilders and athletes do, can this enhance cancer growth? Most people who follow a ketogenic diet inadvertently restrict their calories without actually reaping the metabolic benefits of a calorie deficit, which include reductions in blood glucose, insulin, and triglycerides. The reason for this is that they don’t replace the carbs (and protein) they’ve eliminated with high enough amounts of healthy fats. “Paradoxically, when you’re eating more fat, your blood fats will go down, due to a calorie deficit, and HDL [so-called ‘good’ cholesterol] goes up. Almost everyone that I see on these high-fat ketogenic diets has improved HDL levels,” Dr. D’Agostino says. Now, when we say increase the fat, we’re not talking about the most common fat that people eat, which are primarily highly processed vegetable oils that are full of omega-6 fats, or trans fats found in French fries and doughnuts. We’re talking about high-quality fats like avocados, butter, coconut oil, macadamia nuts, and olives. These types of fats, which Dr. Rosedale believes are metabolically neutral because they don’t tend to trigger hormonal signaling events like leptin, insulin, and the mTOR pathway. “I think a lot of the fats can be used in place of protein. And fats are very protein sparing, decreasing your need for protein,” Dr. D’Agostino says. Bear in mind that while a traditional ketogenic diet calls for quite a bit of dairy products, dairy can actually be problematic and may prevent many of the health benefits that you can get from the ketogenic diet described by D’Agostino and Seyfried. Lactoseis a sugar made from galactose and glucose that is found in milk, making up anywhere from two to eight percent of milk by weight. These extra sugars can be problematic when seeking to lose weight or treat cancer, even if from raw organic sources. Dairy fat is acceptable (e.g. sour cream, butter, etc. ), but foods high in dairy protein or lactose should be minimized or avoided. Your body can burn two types of fuel: fat and carbs. In my estimation, I suspect about 99 percent of Americans are adapted to burning carbs as their primary fuel. It’s important to realize that when your body is adapted to burning carbs, you’re quite inflexible, metabolically speaking. Without fail, your body will be screaming for food about every two to three hours. These kinds of hunger pangs vanish once you become fat adapted, however. Then you can go all day and not be hungry, because you have far more fat in your body to burn than glucose. So how do you achieve this metabolic switch-over? In my experience, intermittent fasting , where you gradually restrict the window of time during which you eat food down to about six to eight hours, is one of the most effective ways to make this transition. “I think from a practical standpoint, the important question is what’s a person going to follow? From my perspective, the biggest hurdle here is compliance; compliance to a dietary strategy that makes calorie restriction feasible and possible. And you know, carbohydrate restriction, high-fat diet, and intermittent fasting is one way to achieve that,” Dr. D’Agostino says. Dr. D’Agostino recently published a paper in the journal PLoS One, titled “The Ketogenic Diet and Hyperbaric Oxygen Therapy Prolong Survival in Mice with Systemic Metastatic Cancer.” Most people who die of cancer die from the metastatic process, rather than from the tumor itself. 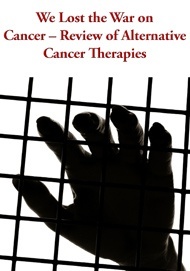 There’s really no treatment or cure for metastatic cancer. Dr. D’Agostino’s team has demonstrated that the ketogenic diet by itself can extend survival in animal models of metastatic cancer, but when it’s combined with hyperbaric oxygen therapy three times per week, there is an additive effect. “You get a significant reduction in tumor growth, decrease in tumor size, and significant extension of life when the therapeutic ketosis achieved through the ketogenic diet is combined with hyperbaric oxygen,” he says. “Tumors thrive in a low-oxygen environment. As a tumor grows, it exceeds its ability to supply oxygen to the center of the tumor. That low level of oxygen, called hypoxia, further activates the oncogenes; cancer promoting genes. It activates things like HIF-1-alpha and VEGF. IGF-1 signaling goes up. Hyperbaric oxygen can reverse tumor hypoxia intermittently. In doing that, it can actually turn off the oncogenes. There are published reports on this. To help you determine if you’re in ketosis, you can purchase a blood ketone and glucose meter, both of which are available in most drug stores. Amazon.com also sells them. Dr. D’Agostino recommends the Precision Xtra by Abbott Labs. Their ketone test strips are called Precision Xtra. Glucose meter strips typically sell for about 50 cents per strip, while ketone strips can range from $3-6 each. By testing your glucose and ketones, you can monitor your response to a nutritional intervention, and then adjust your calories and the macronutrient ratios to optimize your body to be in what Dr. D’Agostino calls the “metabolic zone.” The metabolic zone is defined as sustained hypoglycemia (55-75 mg/dl) with elevated blood ketones (>2 mM). As you implement the ketogenic diet, you can just check your glucose and ketones once a week if you find the cost of the strips to be prohibitively expensive for more frequent testing. Typically, if your blood glucose stays at 75 or below with carbohydrate restriction, there’s a good chance that you’ll be in nutritional ketosis, which is where you want to be. If you’re in ketosis by evidence of ketones in your urine, you’re in a situation where you likely have depleted glycogen stores in your liver. This means you’re maintaining a low blood glucose, which is good. The driver for hepatic ketogenesis is low blood glucose and low glycogen levels in the liver, as this means your body is depleted of glycogen. Your body will not really make adequate ketones (>2 mM), and they won’t spill over in your urine, unless you’ve achieved that level of glycogen depletion. 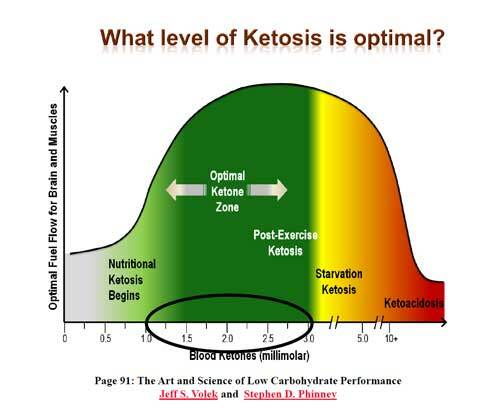 So remember, when your levels of blood ketones are 1-3 millimolar (mM) that’s a good biomarker of nutritional ketosis. Last but not least, ketoresearchchem.com is a resource for scientists interested in ketone research. Please note that the ketone supplements offered there are strictly for research only, and are NOT available for sale to cancer patients. I firmly believe the ketogenic diet can be a tremendously beneficial strategy for optimizing your health and disease prevention and treatment plan, including cancer. It’s already a well-established first line of treatment against many seizure disorders. While most of your body’s cells have the metabolic flexibility to use either fat or sugar for fuel, cancer cells differ in that they cannot use fat (ketones) to survive—they need glucose, and a low-oxygen environment. Back in the 1930’s, Dr. Otto Warburg actually received a Nobel Prize for his discovery that sugar is the primary fuel substrate for cancer cells. The “Warburg effect” in cancer cells is the basis of positron emission tomography  (18-FDG PET), a medical imaging  technique to visualize cancer. 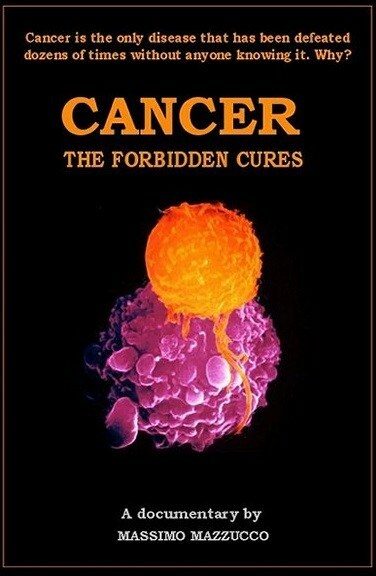 Oncologists have ignored this vital information for over 80 years and don’t use it therapeutically, which in my view is just reprehensible malpractice… So many people suffer needlessly because they don’t have access to this simple nutritional therapeutic strategy, which, in a nutshell, takes advantage of this intrinsic metabolic differential between healthy and cancerous cells. Your body has a limited storage of sugar, stored in the form of glycogen, typically in your muscles and liver. These glycogen stores are depleted in about 12 hours or so, at which point your body has to switch to burning fat. This is part of what makes intermittent fasting so beneficial, because by not eating for 12-18 hours or longer each day, your body shifts into this fat-burning mode. While frequent hunger is a major issue for most people who are reliant on burning carbs for energy, fat-burners can go all day, or a number of days if necessary, without food, since most of us have plenty of fat to be used for fuel. While most people can still eat some carbs, along with moderate amounts of high-quality protein, those with cancer need to be far more strict. Cancer patients also need to combine a ketogenic diet with calorie restriction to achieve glucose depletion that will effectively starve the cancer cells. Recent research also shows that adding hyperbaric oxygen treatment will dramatically reduce cancer growth and shrink tumors. All in all, I can find no drawbacks to eating this way, which is why I highly recommend it for everyone.